36 published items with the word (s) or phrase Christophe Josse in News, Trends, Videos, Photo galleries, Agenda and sorted by "date descending". Paris Haute Couture Week begins in the French capital on Monday, offering an increasingly attractive program in which couture houses rub shoulders with emerging designers, foreign brands and ready-to-wear labels. After New York, London and Milan the fashion world on Tuesday turns its attention to Paris for nine days of ready-to-wear shows with the highlight expected to be New York star Alexander Wang's first show for Balenciaga. French design houses Alexis Mabille and Maison Martin Margiela are to join the exclusive club of haute couture fashion, showing their first spring collections in Paris next month, organisers said on Tuesday. 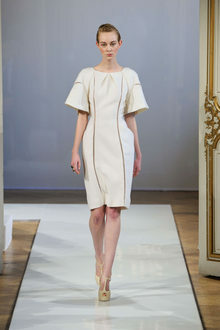 The noble lines of a Japanese architect's church were the inspiration behind the pure, restrained look sent out by Christophe Josse on day one of the Paris haute couture shows on Monday. John Galliano tapped the rich heritage of the house of Christian Dior on Monday, sending out a strong collection with an distinct 1950s flavour on the first day of the Paris couture shows. ...le 1er juillet prochain.La première journée de Haute Couture sera marquée par les présentations d'Adeline André, Christophe Josse, Azzaro Couture, puis Givenchy en fin de journée. For the 2013 Ball, Debutantes from abroad are dazzled by French couture houses.